Fotios, S, Uttley, J, Fox, S. Exploring the nature of visual fixations on other pedestrians. Lighting Research & Technology. First published online, August 26, 2016. doi: 10.1177/1477153516666132. Fotios, S, Uttley, J. Illuminance required to detect a pavement obstacle of critical size. Lighting Research & Technology. First published online, July 20, 2016. doi: 10.1177/1477153516659783. Fotios, S, Castleton, H, Yang, B. Does expression choice affect the analysis of light spectrum and facial emotion recognition? Lighting Research & Technology. First published online, June 1, 2016. doi: 10.1177/1477153516651923. Fotios, S, Castleton, H. Specifying enough light to feel reassured on pedestrian footpaths. LEUKOS, 2016; 12(4); 235-243. doi: 10.1080/15502724.2016.1169931. This project will validate proposals for new design criteria for residential roads established in the MERLIN project, these leading towards lower light levels than current practice, reducing the energy consumed by road lighting (and thus also CO2 emissions) whilst maintaining the visual benefits of road lighting. This will be done through further analysis of the MERLIN data, further experiments using the apparatus and methods established in MERLIN, and field studies in collaboration with local authorities. Effect of ambient light on active travel. We previously carried out an analysis of pedestrian and cyclist count data from the US using daylight saving clock changes (Uttley & Fotios, 2017) to show that daylight significantly increased the number of active travellers, compared with darkness. We recently completed an additional analysis using the same source of data (http://www.bikearlington.com/counter-data/) but an alternative method to validate this finding. Whereas before we used counts in the same hour of the day in the two weeks before and after a clock change, the new analysis used data for the same hour of the day but across the whole year. For part of the year this hour (18:00-18:59) is in daylight, for the other part it is in darkness. Counts in this hour in daylight and dark are compared with counts in control hours (e.g. 15:00-15:59) that have the same light condition throughout the year, using an odds ratio approach. Using this method, odds ratios were again significantly above one, confirming the finding from the previous clock change analysis that daylight significantly increases the number of people walking and cycling. In the latest analysis we also compared locations of counters that had some form of lighting present with counter locations that did not. This comparison suggested lighting may help to encourage more to walk and cycle when it is dark, as the relative difference in numbers in daylight and dark was not as great at lit locations compared with unlit locations. The potential for lighting to negate the effects of darkness and encourage more active travel is something we plan to investigate further. Our new analysis of the US pedestrian and cyclist count data has recently been accepted for publication in Lighting Research & Technology. Comparison of whole year analysis method used in new analysis (left) and clock change method used in previous analysis (right). Road lighting and reassurance. PhD student Aleks Liachenko Monteiro has carried out a series of surveys about safety and reassurance with pedestrians on residential streets in Sheffield. The surveys asked participants a number of questions related to how safe they felt on a number of streets they were taken to. The novelty of the approach taken was that the same participants answered these questions whilst on the streets during daylight and also after-dark, following a method developed by Boyce (Boyce, 2000) The difference between daylight and dark ratings indicates the relative effect of road lighting on the street to improve feelings of reassurance. A small difference in ratings would suggest the participant feels as safe or almost as safe in darkness as they do in daylight, suggesting the lighting is effective in providing reassurance. A large difference in ratings however would suggest participants feel a lot less safe in darkness compared with daylight, suggesting the lighting is not very effective in improving reassurance. Aleks and her colleagues in the Lighting group are currently analysing the results from the surveys, and comparing these to measurements of the lighting taken on each of the streets, to determine the relationship between reassurance and light levels. Initial results suggest reassurance improves as illuminance increases (see graph comparing mean horizontal illuminance against mean day-dark difference in safety ratings), and we are now refining our analysis and assessing what effect uniformity has on reassurance, as well as illuminance. 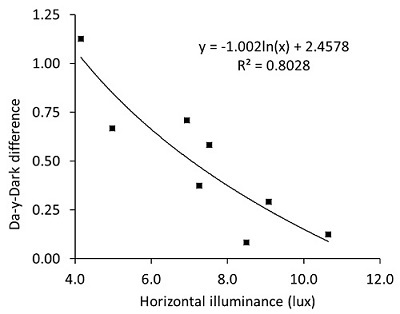 Association between horizontal illuminance and mean difference between daylight and after-dark ratings of safety. One way in which lighting is thought to make people feel reassured is by enabling them to make judgements about the intentions of other people on the street and the potential threat they pose. A proxy for this judgement is the ability to recognise the emotion that someone is expressing – for example, recognising that another person looks angry or happy may influence how safe we feel. Previous research carried out by the lighting group has investigated the effect of lighting on the ability to recognise emotions on faces by presenting these faces using a non-self-luminous screen similar to a kindle screen (e.g. Yang & Fotios, 2015; Fotios et al, 2017). We are currently preparing an experiment that will develop this line of research further by using scale 3-D models of faces expressing emotions, rather than a flat screen, and by introducing other variables to make the task more realistic such as alternative light positions, a source of glare and a concurrent obstacle detection task. Looking at important features: Further analysis has been completed of the eye-tracking videos collected during the first MERLIN project, in which pedestrians walked a real-world urban environment. The aim of this analysis was to better understand two critical visual tasks performed by pedestrians that were identified in MERLIN – looking at other people and looking for obstacles / potential trip hazards. The main conclusions of this analysis were that pedestrians had a tendency to first fixate other people at a distance of about 15 m, and for a duration of 500 ms. Detection of pavement obstacles tended to occur at around 3.4 m. These conclusions not only further our understanding of real-world visual behaviour, but also provide typical fixation characteristics that can be used to inform the design and interpretation of experiments about lighting, interpersonal judgements and detection of obstacles. For example, knowing what distance an obstacle is detected can help interpret data about illuminance levels required to detect at this distance. A review of literature about critical obstacle heights suggested pedestrians need to see obstacles of approximately 10 mm or greater, to avoid potentially tripping. Based on results from previous MERLIN research (Uttley, Fotios & Cheal, 2015), an illuminance of up to 0.9 lux is required to detect a 10 mm obstacle at 3.4 m. This finding is being fed into ongoing work with the international lighting organisation, the CIE, to update road lighting standards. Figure 1. 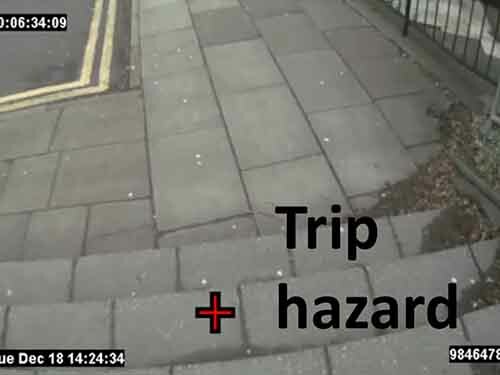 Example image from eye-tracking video, showing fixation at a trip hazard. Light encourages walking: A key purpose of road lighting is to help people continue their everyday activities after-dark, such as travelling between places in the local area. Encouraging the use of active travel, e.g. walking and cycling, is a policy aim for many Governments, and road lighting may help support active travel after-dark. To examine whether light conditions do indeed influence the number of active travellers, data about pedestrian and cyclist frequencies in a district in the United States was analysed. 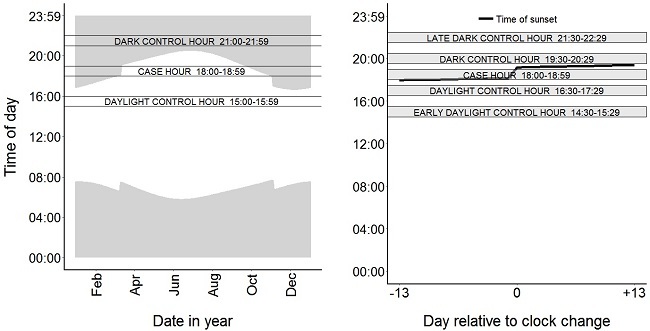 A novel method was used to compare daylight conditions with after-dark conditions which controlled other factors that may influence the numbers of active travellers, such as seasonal variation and time of day. This involved comparing a one-hour period before and after the biannual daylight saving clock changes that occur every Spring and Autumn. This hour was selected so that the light condition was different before or after the clock change, being either dark or daylight. Analysis showed that the numbers of pedestrians and cyclists was significantly higher during daylight conditions compared with dark conditions when compared against changes in control periods when the light condition did not change. This effect was evident even when changes in daily temperature were accounted for. This finding shows the importance of light conditions on pedestrian and cyclist numbers, and supports the use of road lighting as a policy measure to encourage active travel. Figure 2. 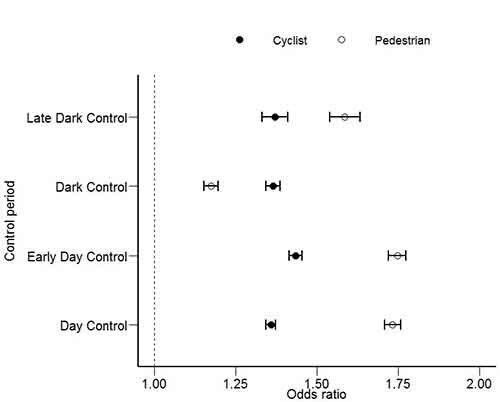 Odds ratios comparing numbers of cyclists and pedestrians during daylight with after-dark, relative to control periods in which light condition did not change. Odds ratios greater than one indicate greater frequencies during daylight compared with after-dark. Error bars show 95% confidence intervals, p = 0.05. Ongoing work: A further important role of road lighting is to make people feel safe when out walking after-dark. An experiment is currently being planned to better understand the impact lighting has on feelings of reassurance, and to identify the best lighting conditions for making people feel safe. In the experiment participants will be asked to rate how safe and secure they feel on different streets, both during the daytime and after-dark. The difference between these day and dark ratings gives an indication of the relative effectiveness of the road lighting in making the street feel safe, or at least as safe as during daylight. In addition to these ratings of safety, physiological and eye-movement measures will also be recorded. This data provides alternative emotional and behavioural information about the participants’ reactions to each of the streets under daylight and after-dark conditions, which will provide further information about the impact of the road lighting on how safe the participants feel. This experiment is due to begin by the end of 2016, and will be carried out by Aleks Monteiro, a new PhD student who has started in the Lighting Research Group. Arts Tower, Western Bank, Sheffield, S10 2TN.